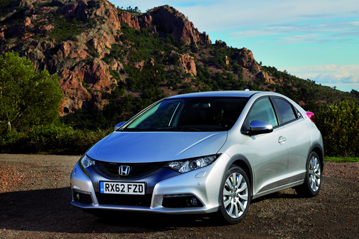 The results of the Honda Civic, first tested in 2007, have been recalculated into the new rating format. The car is unchanged from the one originally tested. Honda have modified the safety system of the Civic for the 2008 model year car. The timing of the pretensioners has been changed to provide better restraint of the front seat passengers and dual stage frontal airbags have replaced the previous single stage units. However, in the frontal test, the driver's airbag was not sufficiently well inflated to prevent the driver's head from contacting the steering wheel. The passenger compartment remained stable. Structures in the dashboard presented a potential hazard to the driver's femurs. The 2008 Civic has a larger side airbag than its 2006 predecessor. Rib deflections were lower, resulting in a score one point higher than the earlier version. However, protection of the chest was weak in the side pole test. Whiplash protection was rated as marginal. From 2009, Honda dealers do not offer a disconnection of the passenger airbag. Therefore, a rearward facing child restraint should not be used in that seating position for 2009 model year cars. There is a clear warning of the dangers of using a rearward-facing child restraint in the front passenger seat. The presence of ISOFIX anchorages in the rear outboard seats was not clearly marked. Honda have made no changes that would influence the results of the pedestrian tests so the results of the car tested in 2006 have been carried over here. Both the bumper and the leading edge of the bonnet scored maximum points for the protection they offered to the legs of pedestrians. The part of the bonnet likely to be struck by a child's head was also rated predominantly 'fair'. Vehicle Safety Assist (Honda's electronic stability control system) is standard equipment on all variants in all countries. The seatbelt reminder covers all seating positions and is also standard across the model range.